KanakoWhere do you wanna go for our next trip? YuichiMmm, do you have any particular place in mind? KanakoWell, I wanna go somewhere which has beautiful landscape. YuichiIt's autumn. That makes sense. How about going on an overnight trip to some hot spring inn in a place famous for the beautiful colored leaves? KanakoGreat! I wanna relax in a hot spring! YuichiYeah, wanna ease up too. KanakoAn inn with open-air baths would be wonderful. Yuichi Open-air bath. Anything else? KanakoAnd…I prefer taking a bath together rather than separately. Yuichi OK! Let's look for an inn with a reserved open-bath, then. There're inns that have rooms equipped with an open-air bath, which are quite expensive though. KanakoTake it easy. Rather I'd be happy to spend money on nice meals instead. YuichiAgree! I wanna eat fresh sashimi. Ah, wait, tasty meat too...it's hard to choose between the two. KanakoHey, how are we gonna look for it? Do you want me to buy you magazines in a bookstore? YuichiThere are various websites on the internet. We can google it. KanakoWe need to decide a place first. YuichiWe'll do that with magazines or websites. Kanako Sure. I'm so excited! The Japanese are famous for loving to go to hot springs. Hot spring trip is a common option not only for families and friends, but also for couples. 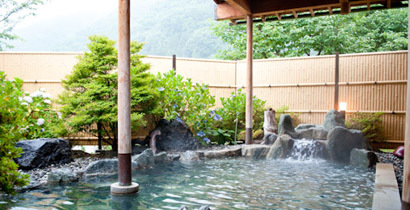 Many hot spring accommodations provide with chartered baths or rooms with open-air baths.